For this problem set, you may work alone or with a partner of your choice but different from anyone you have worked with on PS1 or PS2. If you work with a partner, you and your partner should turn in one assignment with both of your names on it and both people must participate fully in all of the work. You should read the whole problem set yourself and think about the questions before beginning to work on them with your partner. You may discuss this assignment with other students in the class and ask and provide help in useful ways. You may consult any outside resources you wish including books, papers, web sites and people except for materials from previous CS200 courses. If you use resources other than the class materials, indicate what you used along with your answer. Make a CS150 course logo better than "The Great Lambda Tree of Infinite Knowledge and Ultimate Power"
Reading: There is no additional SICP reading for this problem set. You may want to re-read Sections 2.1 and 2.2. Download: Download ps3.zip to your machine and unzip it into your home directory J:\cs150\ps3. ps3.ss — A template for your answers. You should do the problem set by editing this file. graphics.ss — Scheme code for drawing curves. Unlike in Problem Set 1 and Problem Set 2, you are expected to be able to understand all the code provided for this problem set (and all future problem sets in this class unless specifically explained otherwise). This problem set requires less reading and introduces fewer new ideas than Problem Set 1 or 2, but expects you to write considerably more code. As always, we recommend you start early and take advantage of the staffed lab hours. We create fractals by recursively replacing all forward lines in a curve list with the original curve list. Lindemayer found that many objects in nature could be described using regularly repeating patterns. 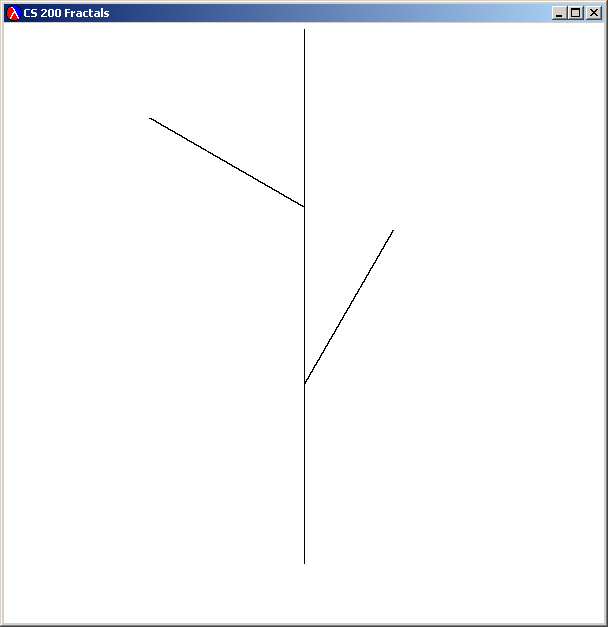 For example, the way some tree branches sprout from a trunch can be described using the pattern: F O(R30 F) F O(R-60 F) F. This is interpreted as: the trunk goes up one unit distance, a branch sprouts at an angle 30 degrees to the trunk and grows for one unit. The O means an offshoot — we draw the curve in the following parentheses, and then return to where we started before the offshoot. The trunk grows another unit and now another branch, this time at -60 degrees relative to the trunk grows for one units. Finally the trunk grows for one more unit. The branches continue to sprout in this manner as they get smaller and smaller, and eventually we reach the leaves. Question 1: Show that (F O(R-60 F) F) is a string in the language defined by our BNF grammar. To do this, you should start with CommandSequence, and show a sequence of replacements that follow the grammar rules that produce the target string. You can use the rule numbers above to identify the rules. We need to find a way to turn strings in this grammar into objects we can manipulate in a Scheme program. We can do this by looking at the BNF grammar, and converting the non-terminals into Scheme objects. ;;; evaluate to the quoted letter. The tag 'f is short for (quote f). (define (make-forward-command) (cons 'f #f)) ;; No value, just use false. (is-forward? lcommand)  evaluates to #t if the parameter passed is a forward command (indicated by its first element being a 'f tag). (get-angle lcommand)  evaluates to the angle associated with a rotate command. Produces an error if the command is not a rotate command (see below for how to produce an error). (get-offshoot-commands lcommand)  evaluates to the offshoot command list associated with an offshoot command. Produces an error if the command is not an offshoot command. (eq? v1 v2)  evaluates to #t if v1 and v2 are exactly the same; otherwise evaluates to false. For example, (eq? 's 's) evaluates to #t and (eq? 's 't) evaluates to #f.
(error message)  produces an error with message a string given as the first parameter. For example, (error "Yikes! Attempt to get-angle for a command that is not an angle command") would display the message in red and stop execution. It is useful to use error in your code so you will more easily identify bugs. Question 3: Define a procedure rewrite-lcommands in ps3.ss that takes a list of L-system commands as its first parameter. The second parameter is a list of L-system commands that should replace every forward command in the first list of commands in the result. Complete the definition of rewrite-lcommands. To make interesting L-system curves, we will need to apply rewrite-lcommands many times. We will leave that until the last question. Next, we will work on turning sequences of L-system commands into curves we can draw. To draw our L-system fractals, we will need procedures for drawing curves. There are many of different ways of thinking about curves. Mathematicians sometimes think about curves as functions from an x coordinate value to a y coordinate value. The problem with this way of thinking about curves is there can only be one y point for a given x point. This makes it impossible to make simple curves like a circle where there are two y points for every x value on the curve. So, a more useful way of thinking about curves is as functions from a number to a point. We can produce infinitely many different points on the curve by evaluating the curve function with the (infinitely many different) real numbers between 0 and 1 inclusive. Of course, we can't really evaluate the curve function at every value between 0 and 1. Instead, we will evaluate it at a large number of points distributed between 0 and 1 to display an approximation of the curve. ;;; Regular points are black. Colored points have a color. Note that we have defined points so we can have both colored points and colorless points that appear black. (window-draw-line point0 point1) — Draw a black line from point0 to point1. For example, (window-draw-line (make-point 0.0 0.0) (make-point 1.0 1.0)) will draw a diagonal line from the bottom left corner to the top right corner. defines a curve that is a horizontal line across the middle of the window. If we apply mid-line to a value x, we get the point (x, 0.5). Hence, if we apply mid-line to all values between 0.0 and 1.0, we get a horizontal line. Predict what (x-of-point (mid-line 0.7)) and (y-of-point (mid-line 0.7)) should evaluate to. Try them in your Interactions window. The procedure draw-curve-points takes a procedure representing a curve, and n, the number of points to draw. It calls the draw-curve-worker procedure. The draw-curve-worker procedure takes three parameters: a curve, the current time step values, and the difference between time step values. Hence, to start drawing the curve, draw-curve-points evaluates draw-curve-worked with parameters curve (to pass the same curve that was passed to draw-curve-points), 0.0 (to start at the first t value), and (/ 1 n) (to divide the time values into n steps). The draw-curve-worker procedure is defined recursively: if t is less than or equal to 1.0, we draw the current point using (window-draw-point (curve t)) and draw the rest of the points by evaluating (draw-curve-worker curve (+ t step) step)). Evaluation Rule 4 - begin. To evaluate (begin Expression1 Expression2 ... Expressionk), evaluate each sub-expression in order from left to right. The value of the begin expression is the value of Expressionk. We stop once t is greater than 1.0, since we defined the curve over the interval [0.0, 1.0]. 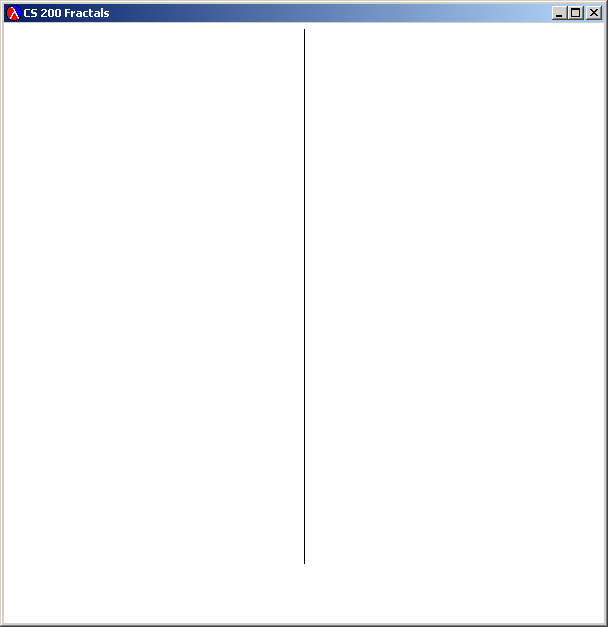 Define a procedure, vertical-mid-line that can be passed to draw-curve-points so that (draw-curve-points vertical-mid-line 1000) produces a vertical line in the middle of the window. Define a procedure, make-vertical-line that takes one parameter and produces a procedure that produces a vertical line at that horizontal location. For example, (draw-curve-points (make-vertical-line 0.5) 1000) should produce a vertical line in the middle of the window and (draw-curve-points (make-vertical-line 0.2) 1000) should produce a vertical line near the left side of the window. We use let here to avoid needing to evaluate (curve t) more than once. In class, we will see that let is just syntactic sugar (that is, a short way of writing) a procedure application. It binds the value (curve t) evaluates to, to the name ct. Note that (rotate-ccw c) evaluates to a curve. The function rotate-ccw is a procedure that takes a procedure (a curve) and returns a procedure that is a curve. Predict what (draw-curve-points (rotate-ccw mid-line) 1000) and (draw-curve-points (rotate-ccw (rotate-ccw mid-line)) 1000) will do. Confirm your predictions by trying them in your Interactions window. Predict what (draw-curve-points (shrink mid-line .5) 1000) will do, and then try it in your Interactions window. Question 5: To check you understand everything so far, define a procedures draw-half-line that uses translate, horiz-line and shrink to draw a line half the width of the window that is centered in the middle of the display window. is a function that takes a curve and produces a new curve that is just the first half of the passed curve. (rotate-around-origin curve degrees) — evaluates to curve rotated counterclockwise by the given number of degrees. You should be able to understand the code in graphics.ss that defines these functions. Predict what (draw-curve-points (connect-rigidly vertical-mid-line mid-line) 1000) will do. Is there any difference between that and (draw-curve-points (connect-rigidly mid-line vertical-mid-line) 1000)? Check your predictions in the Interactions window. The draw-curve-points procedure does not distribute the t-values evenly among connected curves, so the later curves appear dotty. This isn't too big a problem when only a few curves are combined; we can just increase the number of points passed to draw-curve-points to have enough points to make a smooth curve. In this problem set, however, you will be drawing curves made up of thousands of connected curves. Just increasing the number of points won't help much, as you'll see in Question 6. The way connect-rigidly is defined above, we use all the t-values below 0.5 on the first curve, and use the t-values between 0.5 and 1.0 on the second curve. If the second curve is the result of connecting two other curves, like (connect-rigidly c1 (connect-rigidly c2 c3)) then 50% of the points will be used to draw c1, 25% to draw c2 and 25% to draw c3. Think about this yourself first, but look in ps3.ss for a hint if you are stuck. There are mathematical ways to calculate this efficiently, but the simplest way to calculate it is to define a procedure that keeps halving the number of points n times to find out how many are left for the nth curve. This means if we connected just 20 curves using connect-rigidly, and passed the result to draw-curve-points with one million as the number of points, there would still be only one or two points drawn for the 20th curve. If we are drawing thousands of curves, for most of them, not even a single point would be drawn! To fix this, we need to distribute the t-values between our curves more fairly. We have provided a procedure connect-curves-evenly in graphics.ss that connects a list of curves in a way that distributes the range of t values evenly between the curves. To draw an L-system curve, we need to convert a sequence of L-system commands into a curve. We defined the connect-curves-evenly procedure to take a list of curves, and produce a single curve that connects all the curves. So, to draw an L-System curve, we need a procedure that turns an L-System Curve into a list of curve procedures. We define convert-lcommands-to-curvelist recursively. The base case is when there are no more commands (the lcommands parameter is null). It evaluates to the leaf curve (for now, we just make a point of green — you may want to replace this with something more interesting to make a better fractal). Since convert-lcommands-to-curvelist evaluates to a list of curves, we need to make a list of curves containing only one curve. Otherwise, we need to do something different depending on what the first command in the command list is. If it is a forward command we draw a vertical line. The rest of the fractal is connected to the end of the vertical line using cons-to-curvelist. The recursive call to convert-lcommands-to-curve produces the curve list corresponding to the rest of the L-system commands. Note how we pass (cdr lcommands) in the recursive call to get the rest of the command list. Question 7: Fill in the missing code for handling rotate commands (marked as Question 7 in ps3.ss). You will want to use (rotate-around-origin curve rotate-angle) somewhere in your code to rotate every curve after the rotate command by the rotate-angle. Question 8: Fill in the missing code for handling offshoot commands (marked as Question 8 in ps3.ss). The code for position-curve is in curve.ss. You don't need to look at it, but should be able to understand it if you want to. Now, you should be able to draw any l-system command list using position-curve and the convert-lcommands-to-curvelist function you completed in Questions 7 and 8. Try drawing a few simple L-system command lists before moving on to the next part. Question 9: Define a procedure make-lsystem-fractal in ps3.ss that takes three parameters: replace-commands, a list of L-system commands that replace forward commands in the rewriting; start, a list of L-system commands that describes the starting curve; level, the number of iterations to apply the rewrite rule. Hint: You should use the rewrite-lcommands you defined in Question 3. You may also find it useful to use the n-times function from the September 12 class. 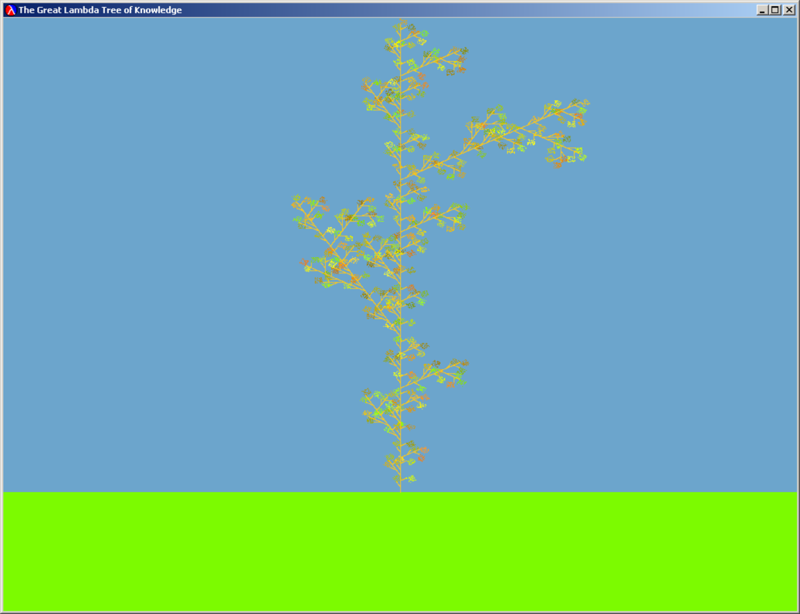 For example, (draw-lsystem-fractal (make-tree-fractal 3)) will create a tree fractal with 3 levels of branching. 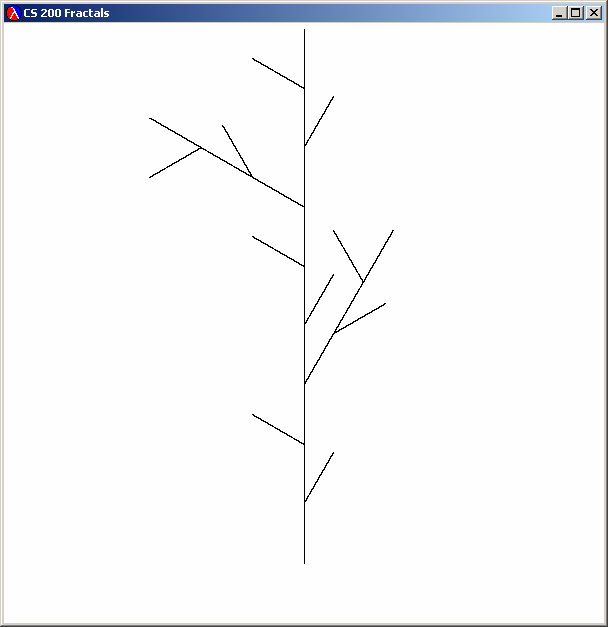 Question 10: Draw some fractals by playing with the L-system commands. 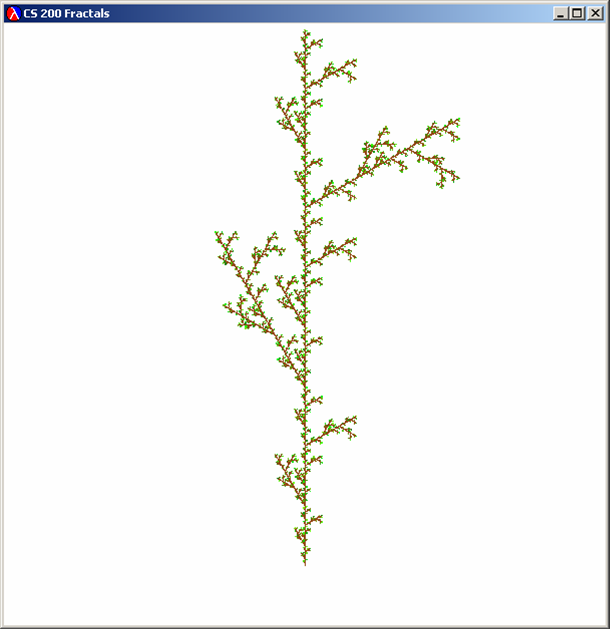 Try changing the rewrite rule, the starting commands, level and leaf curve (in convert-lcommands-to-curvelist) to draw an interesting fractal. You might want to make the branches colorful also. Try an make a fractal picture that will make a better course logo than the current Great Lambda Tree Of Infinite Knowledge and Ultimate Power. The best pictures will appear on the course web page and will be rewarded with untold fame, invaluable fortune and maybe even a double gold star on this problem set. Turn in the code you used, as well as a printout of the display window. If your fractal deserves to be seen in color, email your code and an image of it to cs150-staff@cs.virginia.edu. Credits: This problem set was originally created for CS200 Spring 2002 by Dante Guanlao, Jon Erdman and David Evans, and revised for CS200 Spring 2003 by Jacques Fournier and David Evans, and revised for CS200 Spring 2004 and CS150 Fall 2005 by David Evans.